Submissions to the 2019 Sue C. Boynton Poetry Contest are now closed. If you submitted a poem, thank you! Winners will be notified by phone or e-mail by April 30, 2019. Whether you submitted a poem or not, you are invited to the awards ceremony on Thursday, May 16, 2019, 7:00pm, at the Bellingham Cruise Terminal. Portland, Oregon, community radio station KBOO airs Talking Earth, interviews on poetry, spoken arts, and prose, on the second and third Monday of every month from 10:00 to 11:00pm Pacific. Programs are archived back to 2015. Have a listen. 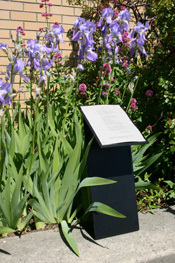 We’ve had plenty of posts on sidewalk poetry: stenciled, stamped, chalked, engraved on metal plaques, etc. In Mill Valley, California, they’ve come up with yet another way to get poetry onto the sidewalk: project it. Poetry Illuminated will be on view in the downtown area each night through the end of April 2019. Read the article in the Marin Independent Journal and stop to read the poems if you’re in the neighborhood. With National Poetry Month right around the corner, this is a good time to get your ducks, or at least your prompts, in a row. Two Sylvias Press is offering an all-new batch of 30 Prompts for National Poetry Month, delivered fresh to your email box each day of April. There’s a small fee (less than 50 cents a prompt!) or, if you’d like to have one of your poems critiqued, you can pay a little extra and get a line-by-line critique by one of the editors of Two Sylvias Press.